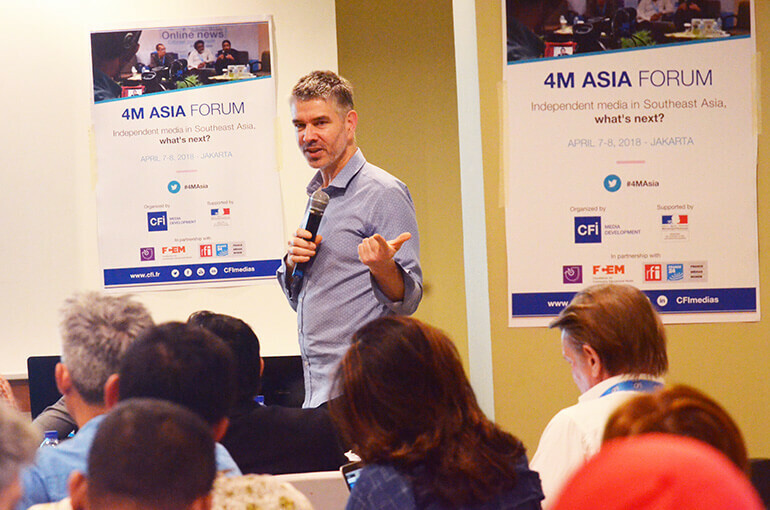 CFI launched the 4M Asia project in 2014 with the aim of strengthening local, community and national media, making use of the opportunities offered by the digital age. When the project came to an end in April 2018, CFI outsourced a final evaluation report. Summary of the results. 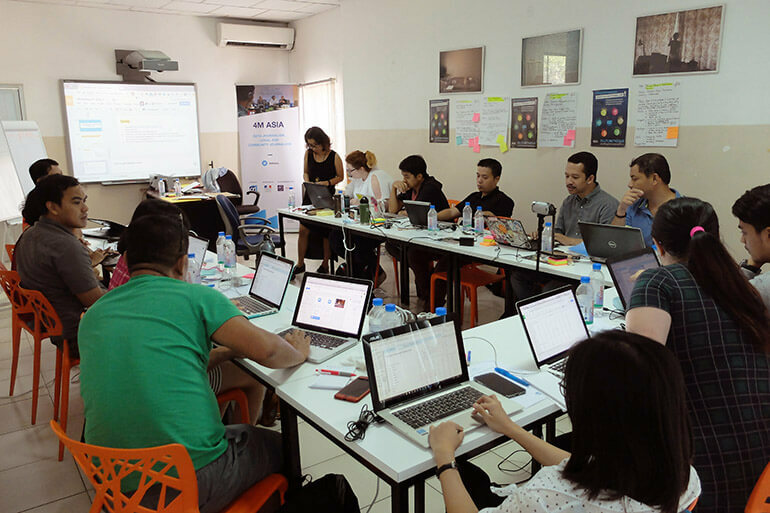 The overall objective promoted by the 4M Asia media pluralism support project was "to guarantee the necessary pluralism for a healthy dialogue and national/regional cohesion in the ASEAN countries by addressing local and community issues and by developing online media journalistic tools and activities". It ably presented the emergence of the media from a past dominated by traditional or governmental outlets and the advent of greater freedom, a pluralist and largely citizen-led era of news and information supported by the revolution in digital tools and, most notably, social media. This turn-around led to a fresh treatment of local concerns by the media, alongside a more inclusive and publicly accountable model of society. 4M Asia thus took under its wing certain media that were widely viewed as on the fringes owing to their remoteness from a capital city, their limited financial resources, the media used (blogs, radio, etc.) and, last but not least, their focus on community matters. - The creation of digital networks, and the sharing of digital best practices and experiences within the ASEAN media regional community. - A higher profile for community issues and specific local news at national level, through the creation of an aggregator site by the Indonesia AJI (Independent Journalists' Alliance). - An increase in local and minority topics in the media both locally and nationally as a result of the opportunities offered by digital technology. - The development of new skills on the part of media stakeholders in the use of data journalism and data visualisation digital tools with a view to promoting new journalistic forms allowing broader expression of the diversity of opinion within society. The final 4M Asia evaluation, carried out between January and April 2018, was delivered upon completion of the programme. 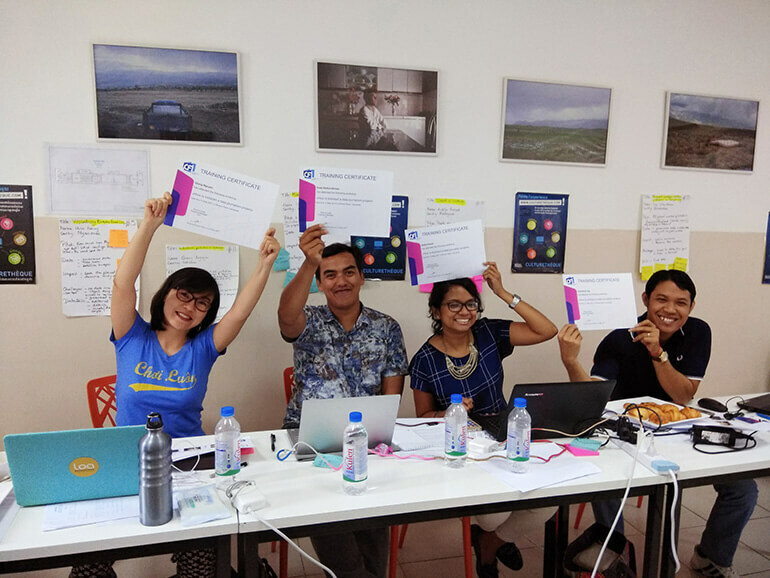 The evaluation team observed four activities, notably the closing forum in Jakarta in April, after four years' collaboration. It noted discussion of community issues across the various groups of beneficiaries and, albeit of lesser impact in terms of outcome 4, which targeted media with greater influence. This was in line with the first specific aim of "supporting journalists and media organisations in taking account of community matters at editorial level in order to encourage them to incorporate them into their digital strategy". The second specific objective related to "supporting the region's media in their switch to digital, particularly through the acquisition of new tools, in order to increase their readership and consolidate their economic model". This was largely covered by training courses offered in Indonesia, Thailand, Cambodia, the Philippines and Malaysia. Sponsors 4M Asia has made a positive contribution to the media aid environment in South East Asia.are thinner on the ground than previously and this has meant that support has been focused at national level, the lever effect of regional dynamics being underestimated. 4M Asia has therefore been able to reach out to a group of countries experiencing political and economic pressure. In the meantime it has brought back to the aid fold countries that, despite still suffering very considerable local inequalities, left on account of their positive economic indicators. 4M Asia has brought different media families together under one programme. The level of support and sharing amongst professionals is testament to the sore need for exchange and transfer arising out of technological progress and public expectation. 4M's community mobilisation potential was not exploited to the full, mainly because outcome 1 acted as a point of contact rather than as a catalyst. Nonetheless, links – even an alliance – have been forged or consolidated beyond the field of activities, thanks to initiatives on the part of CFI project managers, the people involved and cross-discipline experts. Training courses responded to needs that were considerable, or even very considerable, depending on the beneficiary. This response was based on an understanding of the overall issues facing the media, rather than an understanding of contexts and limitations specific to a certain region or country, thereby restricting prospects for local resonance, adaptation and, ultimately, replication. Far from being questioned, training provision by French and international experts was highly regarded by all beneficiaries, in terms not only of the level of expertise available but also the quality. Such appeal and recognition was seen above all at regional level, owing to the variety of views and languages. The training sessions offered in Indonesia by a single French expert highlighted the limitations of instantaneous translation and the restricted level of comprehension and knowledge acquisition by attendees. Expenses management was heavily geared towards attracting as many attendees as possible. Travel expenses accounted for the majority of costs, and considerable efforts were undertaken to keep experts' remuneration within reasonable bounds. This efficient management of resources, albeit in line with 4M's mobilisation objective, is offset by a disproportionate distribution of outcomes in terms of the size of the beneficiary sample and impact expectations; the greatest expenditure item thus yielded the most fleeting result (outcome 1). CFI's institutional flexibility allowed refocusing and additions that would undoubtedly have been much more difficult if 4M had been receiving external funding. This flexibility enabled 4M Asia to adapt its initial – less ambitious and less far-reaching – approach. The resources mobilised in Indonesia (allotted time, proximity to local partner, size of beneficiary sample) illustrated the limitations affecting capacity-building if this This operating method supports a model of adaptation to the local level and opportunities for impact and sustainability.is not accompanied by actions targeting structural and institutional constraints on media development, notably the legal context within which the profession has to operate. CFI's operating method, characterised by the absence of permanent staff based in the field, not only achieved greater efficiency but also promoted involvement and accountability on the part of local partners and to a lesser extent of participants. On the basis of the conclusions and recommendations arising out of this evaluation, CFI could envisage setting up a new field project in South East Asia in 2019. 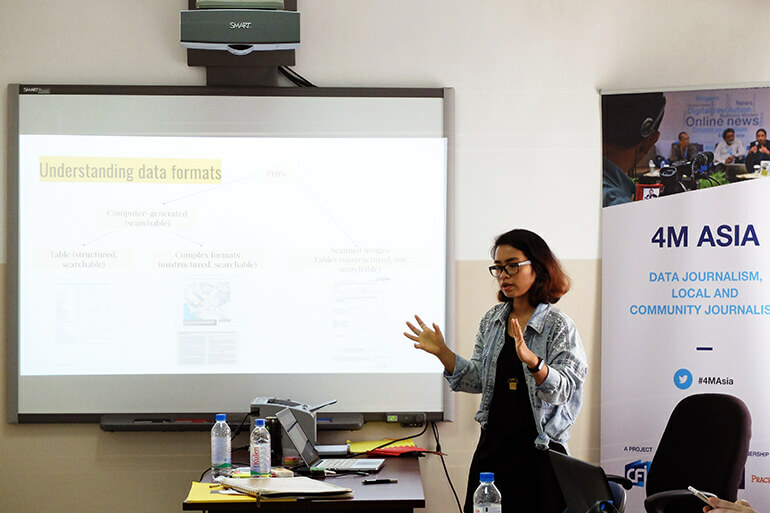 Preparation for the Connexions rurales project, launched in September 2018, which aims to develop the rural news and information landscape in Cambodia, has already incorporated certain aspects of this evaluation.